What can a college graduate do with a secondary education or geology degree? 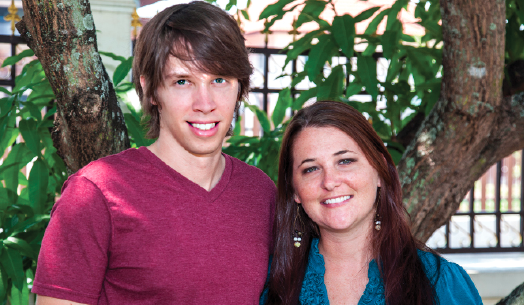 Preston and Kristin Coursey believe you can change the world, one person at a time. During college she served as an intern in Thailand and said she found her heart gripped by the overwhelming need for Christian workers. Her husband, Preston, also developed a love for global work during his time as an exchange student in Thailand. In 2012 the couple went back to Thailand with a desire to do community development and seek roles that would use their individual gifts and educational backgrounds. Preston has a degree in geology and hydrogeology, and Kristin has a degree in secondary education and English. After spending a year networking, learning the language, and assisting others in ministry, the Courseys were ready to begin their full-time work with children’s homes. Through their partnership with Christian Missionary Fellowship (CMF), the Courseys’ work is focused on helping the homes become self-sustainable through income generated by agricultural or micro-enterprising projects. Kristin explained, “I am currently working in an education center that works with children who have been rescued from trafficking or are homeless due to abusive or violent situations.” All of the teen girls there are pregnant or have infants from a violent situation as well. In this setting, Kristin is able to share Bible stories about God’s love for everyone. Preston’s work is focused on agriculture with a concentration on aquaponics, a farming system that requires no land. Instead, fish and plants are harvested in tanks. He is able to come alongside homes to help them build their own systems or to hold trainings for those who want to learn to use aquaponics. Some of the food from the systems can even be donated back to the community. The Courseys’ sacrificial work is both inspiring and necessary. Sometimes it can be a struggle for Christians in the American marketplace to know how to respond. God doesn’t call every person to travel and serve in a foreign land. However, Matthew 28 directs us to “make disciples of all nations.” Scripture implores us to care for the poor and put faith into action. We are called to care for widows and orphans in their distress. As Americans, many of us have been born into a life of privilege. The World Bank reports that approximately 80 percent of humanity lives on less than $10 a day, many existing on less than $2 per day. We have a social responsibility, but we also have a higher calling. God has given each of us gifts to serve others. What education or life experience might you use to meet needs in your workplace, community, or on the other side of the world? Perhaps your financial talent could be put to use by coaching a young couple or a single parent who is struggling with debt. Your nursing degree could benefit a team doing medical checkups in the inner city or on a short-term mission trip. Maybe you are enjoying your retirement years, but your knack for leadership could benefit an emerging business leader. James 1:17 says, “Every good and perfect gift is from above.” What good gift is God calling you to share? Learn more about the Courseys. Jamie Shafer is the communications director at East 91st Street Christian Church in Indianapolis, Indiana. She and her husband, Eric, have two children.